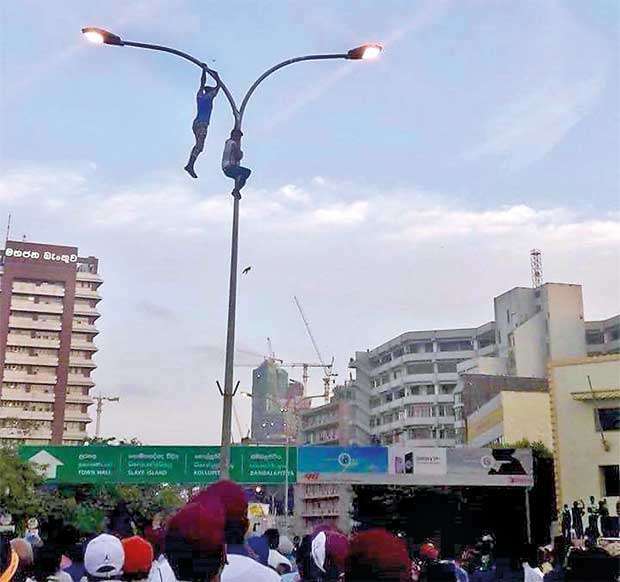 Janabalaya Colombata organised by the Joint Opposition sent thoughts of the Government, which were to silence voices of dissent, into oblivion when the opposition and their supporters poured into Colombo on Wednesday resembling a high tide. Riding on the back of a successful campaign at the last LG Polls, the opposition forces- spearheaded by former President Mahinda Rajapaksa- once again showed that they can gather the numbers needed to stand up and be counted. The key player again in another promising move by the opposition was the former president. Rajapaksa was quick to state during his speech that the country’s President and Premier could visit the north and critisise him because he gave them this right. Rajapaksa has a sharp mind and the skill of wit and this comment simply lifts the opposition forces battling the Government on to a higher pedestal. This Sathyakgraha or peaceful protest rally was just what the opposition needed to steal the limelight from the Government, which till yesterday was in the news for carrying out development work in the country. But the truth is that this regime could do nothing as tens of thousand of supports backing the Joint Opposition poured into Colombo’s central most location, Fort, and demanded that the Government should step down. When considering the fact that the courts turned down requests by three police stations to obtain restraining orders to control the protesters, it suggests that the Government tried to sabotage efforts by the public to gather in large numbers, but failed. Mahinda Rajapaksa has a warrior mentality and we all know that. It is because of this nature that he was able to lead the fight against terrorism and see a successful end to the Tiger rebels. There were claims that a bus carrying protesters from Hali-ela for the rally was attacked. But Rajapaksa saw that the campaign led by him didn’t face major hiccups. A close scrutiny of the crowds also reveals that some of them were brought there on the promise of being looked after. We saw some protesters knocked out after taking a tad too much liquor and some under the influence of alcohol trying to scale utility posts. There were also sing-songs and an angampora (the ancient art of fighting practised by Sinhalese ancestral families) demonstration; items which don’t showcase the frustration within the people, but certainly dents the seriousness of this protest march. Rajapaksa affirmed that this was the first step in a move to send home this Government. He went on to add that the citizenry represented by the poor man to the businessman was hurt by the actions of the Government. Following Sri Lanka Podujana Peramuna’s landslide win at the LG Polls, this is Rajapaksa’s second show of strength in the field of politics after he was defeated at the Presidential Elections in 2015. Before his defeat and after he won the war against separatist Tiger rebels there marked a period of Government-sponsored violence during which most who opposed the Rajapkasa clan were physically abused, killed or forced out of the country. If peace was experienced after 2009, the happiness that prevailed as a result was damped because the Mahinda-Rajapaksa Government gave little value to democracy. But this Rajapaksa seems to have forgotten the past and said during his speech on Wednesday that democracy was disappearing under the present Yahapalana regime. What’s sad about a sizeable section of the country’s citizenry is that they have short memories and are held spellbound by this man sporting a mustache. Members of "Medamulana Circus" performing a Lamp-Post act.